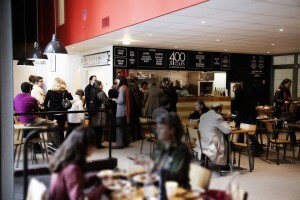 You’re looking to get a drink or lunch in a typical Parisian brasserie in Nation neighborhood? Stop at Comptoir Voltaire and order a croque-monsieur, a Parisian salad dish or a mousse au chocolat… and enjoy daily Paris life – this man stopping for a quick café at counter on his way to work or this family having a snack back from next playground. 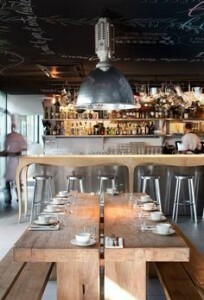 Comptoir Voltaire is equipped with high chair and a piece of furniture will allow you to change baby in bathroom. 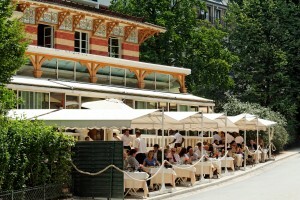 Come for a family lunch or dinner at the summer terrace of the restaurant gastronomique “le Pavillon Montsouris”, located in the park Montsouris. Before or after a beautiful walk in the park, you can enjoy fine cuisine in a 1900’s pavilion. You can also check the menu on their website. And do not worry! Everything is planned to welcome children: menus, high chairs and a changing table. Are you looking for a chic place where your children are welcome? Mama Shelter is the ideal restaurant, not far from Pere Lachaise. 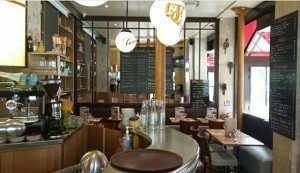 The restaurant of the Mama Shelter’s hotel is a very beautiful and modern place, with a discrete entrance in the long rue de Bagnolet. Customers can relax in the sun in big wicker armchairs, but it is the main room which is suitable for families. The aisles are wide enough for strollers, you can ask for high chairs and there is a changing table in the toilets. The kids’ menus are brought with coloring pencils and paper. And you don’t have to worry about the meals: ham with pasta, chicken with fries or a little Pizza Margherita. On Sundays, brunches are organized with projection of cartoons on giant screen. Breakfast from 7:00 a.m. to 11:00 a.m. Lunch from 12:00 a.m. to 3:00 p.m. (except on Sundays) Dinner from 7:00 p.m. to 11:30 p.m. Brunch on Sundays from 12:30 a.m. to 4:30 p.m.
At bottom of Butte Montmartre (on 18th arrondissement side, a bit below Lamarck metro station), l’Etoile de Montmartre is a 100% child-friendly address: small table and chair, with available pictures for coloring and children books, high chair…and even a child toilet (the first one I’ve ever seen in a non specifically baby cafe in Paris!). For adults, traditional brasserie meals (burgers, pasta, “boeuf carottes”, salads etc…). 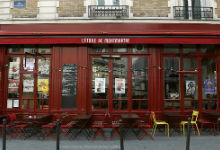 Wifi access, meal served all day long and a real Parisian neighbourhood customers.